The importance of keeping beaches clean is so much bigger than we could imagine, we know that it is unpleasant to walk along a beach covered with garbage carelessly left behind by visitors. However, we can take on good habits to keep our beaches clean, let's discover how. Cleaning beaches with friends and other volunteers can allow you to gain a better understanding of the damage done to the environment and in that way understand how this impacts maritime spaces and their natural life cycle. You wouldn’t like to walk along the beach and find a can, that doesn’t just look bad but could also hurt you; if you wouldn’t like this to happen, don’t do it. Everytime you go to the beach, take a plastic bag with you to put your waste in, and at the end of the day, leave it where it belongs. Did you know that a cigarrette left on the beach can take up to 2 years to desintegrate? Avoid throwing any kind of liquids in the sea, think for a moment of the species that live in the ocean and try to become aware of your actions everytime you go to the beach. It is not because the sea seems infinite, that drinking water is a renewable resource, that’s why during your time on the beach, try to save water just like you would do at home. Respect the area’s wild life, not just the marine wildlife, we’re talking about the birds too. Don’t cut flowers or plants in the area, it is important to respect everything that lives on the beach. Moving anything away from its original climate or region could harm any endemic specie. Fortunately there are many institutions concerned about beach maintenance, Delphinus is one of them.Over the last 3 years, we have organized 12 cleanings where we have collected more than 4,400 kg of waste with the collaboration of 1,581 volunteers. In order to do this, the help of others is vital. 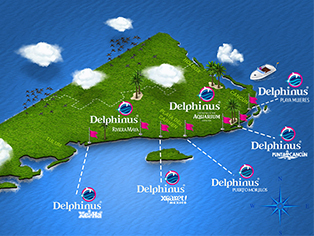 In Delphinus, we are concerned with maintaining our natural habitats in perfect condition, in order to ensure that you experience a unique swim with dolphins in Mexico and to ensure a healthier world for future generations. Come and live an incredible experience, swim with dolphins in Mexico and get involved in keeping the beaches clean. For a brilliant blue planet!